If you are looking for western baby bedding for the little cowgirl or cowboy in your life, look no further. Baby Bedding Zone can meet all your crib bedding needs. Isn’t this cowgirl set too cute. I love how colorful the pattern is. My niece, who is 4, would love to have this as her bedding. That is what is so neat about most crib bedding. It will grow with the girl or boy to their toddler bed. I picked something that would grow with my son from baby to toddler, so we would not have to go shopping for bedding again with Jakobi. Mason, however, will need an updated set. I was browsing through the babygirl bedding section wishing I had a little girl because the sets were so cute. I just love all the pink and brown. No wonder my sister updates her girls bedding every few years, all the choices! Finally, I got to the boys toddler section, and I came across a blanket that I am actually wrapped up in at the moment. 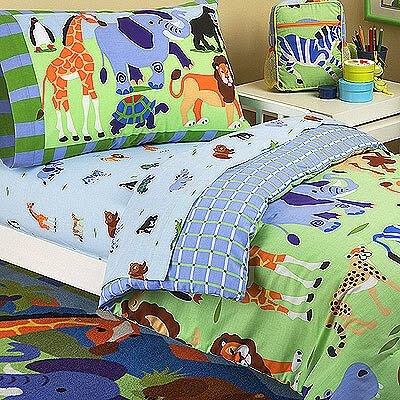 The Wild Animals 4 Piece Toddler Bedding Set by Olive Kids is one of the cutest sets I have ever seen. It was my nephew’s, Parker, before he passed on from leukemia. This blanket serves as a constant reminder of him and is used often. The jungle theme is appealing to boys and girls of all ages and would make a great gender neutral gift. Of course my boys all fight over this blanket because of the interactive features of the fuzzy mane on the lion and the pockets to hide things in. Someone in my house is using this blanket and has used this blanket everyday for the past 3 years which also means this bedding is super durable! This set is even 19% off right now with a savings of $19.00!